Way too much hysteria lately about impending U.S. sanctions against Iranian Oil. The more Iranian oil is removed from the legal markets under sanctions, the more Iranian oil will be available for sale on the black market at deeply discounted cut rate prices. This "fire sale" of cheap (half price?) Iranian black market crude oil will then drive down legal market prices. Simple cause and effect. ● Iranian oil is not going away. ● Iranian oil is *not* being removed from global markets. ● Iranian oil will simply shift from expensive (legal) global markets to dirt cheap (illegal) black markets. Update. China is already switching from importing U.S. crude oil to importing more Iranian crude oil. ... In place of US imports, China, which is the world's largest importer of crude oil, is becoming increasingly reliant on the Middle East and Russia while it has also shifted to using Iranian tankers to bypass impending US sanctions on Iranian crude while also becoming more reliant on Iranian crude in general. I kind of feel the urge to shout "Hurray!" to be honest. Yes, but what about the article that said China was granting their teapots permission to process 40% more crude in 2019? Hmmm. India is not cooperating with U.S. sanctions against Iranian oil. I suspect China won't either. From others posts I have made under other topics, China is in fact cutting their Iranian imports and have increased imports of WAF crude oils. China is set to boost its crude imports from West Africa to the highest in at least seven years this month as the trade war with the U.S. prompts the Asian nation’s refiners to find alternatives. 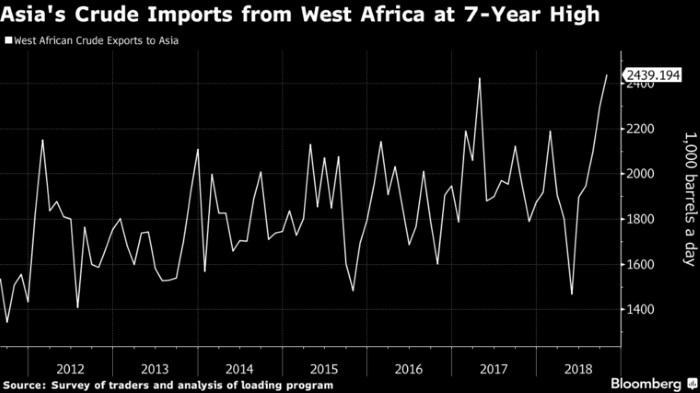 Chinese refiners have bought about 1.71 million barrels a day of crude for October loading from West Africa, the most since at least August 2011 when Bloomberg started compiling the data, according to a survey of traders and analysis of loading programs. In total, Asia’s crude imports from West Africa in October will jump to 2.44 million barrels a day, also a seven-year high. The trade war with the the U.S. has cut China’s interest in buying shale oil which is similar in quality to West African crude. Unipec, the trading arm of top Chinese refiner Sinopec, recently put a plan to boost U.S. crude imports on hold. The impending return of sanctions on Iranian crude further limits the availability for Chinese buyers. Russia has “benefited tremendously” from its co-operation with OPEC over recent months, the head of Russia’s investment fund said Wednesday, but rising oil prices are quickly becoming a concern. International benchmark Brent crude and U.S. West Texas Intermediate (WTI) both jumped earlier this week to levels last seen in November 2014, as oil traders await U.S. sanctions against Iran’s oil imports. “Russia is not really interested in incredibly high oil prices, we actually feel that the current level is even (too) high and maybe should be a little bit lower,” Kirill Dmitriev, the chief executive of the Russian Direct Investment Fund (RDIF) told CNBC’s Geoff Cutmore in Moscow on Wednesday. “Cooperation with OPEC is not only an agreement to increase prices, it is an agreement to stabilize prices. So, if prices become too high then both Saudi Arabia and us have the capability and capacity to increase production,” Dmitriev said. Brent crude traded at around $85.30 on Wednesday, up around 0.6 percent, while U.S. West Texas Intermediate (WTI) stood at around $75.55, more than 0.4 percent higher. Both Brent and WTI contracts have soared by around 20 percent and 17 percent respectively since mid-August. The Trump administration’s push for the Middle East-dominated cartel to start pumping more oil comes as the White House prepares to impose sanctions against Iran in just under five weeks’ time. U.S. sanctions against Tehran are widely expected to have an immediate impact on Iran’s oil exports, although the estimates of exactly how much of the country’s oil could disappear from November 4 vary widely. Some energy market analysts expect around 500,000 barrels per day (bpd) to disappear once U.S. sanctions against Iran come into force, while others have warned as much as 2 million bpd could come offline over the coming months. “The Iran factor is the primary near-term price driver and as such spikes will be the norm in the coming weeks,” Stephen Brennock, oil analyst at PVM Oil Associates, said in a research note published Wednesday. “The bullish roller-coaster will remain in full-swing for now, but don’t be surprised if it grinds to a halt as we approach the turn of the year,” Brennock added. It will be interesting to see just how large the discount will have to be to "clear the market." Think this one through: A VLCC tanker holds 2 million barrels. If the drop off "list price" is ten bucks, that is twenty million dollars, all tax-free cash, for whoever puts the phantom deal together. The problem is, however, that they "get caught," and then the entire cargo of $150 million gets tangled up in US revenge politics. Would the US instruct the US Navy to torpedo and sink a VLCC tanker? That would really be over the top. It becomes an act of aggression against the "flag state" of the ship. The insurer would refuse to pay on insurance, saying that "acts of war" are not an insurable risk. If "The Donald" ordered such a sinking, as a lesson to other blockade-runners, would the admirals of the US Navy comply? (Short answer: probably not.) OK, so what does this do to the price discount, needed to tempt some blockade-runner to tempt fate and risk it? My guess is twenty bucks. The first ten is for the smuggler. The second ten is for the Buyer, and remember he has risk too, as the US will inevitably institute a "secondary boycott" against that actor. Who is prepared to shrug off American trade wrath for a discount of ten bucks? I can think of lots of players: South Africa comes to mind. How about Argentina? Ceylon? Pakistan? Canada? Yup, even Canada has some very small refineries located out in Newfoundland, down around 18,000 bpd. A small operation, under profitability pressure, is easily tempted by a bandit runner of Iranian crude, especially is it is pumped ship-to-ship out in the ocean and not traceable to Iran. What do you care, if that is your refinery, about Donald Trump? Your 500,000 barrels per month at a discount of even only ten bucks hands you an extra five million of free cash flow. Awful tempting! Even more tempting if you can get a fatter discount! I say that every drop of Iranian oil will find a buyer, the real issue is: how much does Iran have to "eat" in discounts to move the product? I don't think it will go to half-price: could run to $20 discount, though. We live in interesting times. Do tell the long answer.